ChannelMfm - Evaporated milk is a product of canned milk made from fresh milk. Fresh milk which is used will in reduce the water content. Milk of this type is commonly also known as condensed milk without sugar. The process of making evaporated milk began to evaporate the water content up to 60 percent followed by the process of homogenization. After going through both of these processes, the milk is then packed in cans and heated to 115-118 degrees Celsius for 15 minutes for the purpose of sterilization. The reduction of the water content in the evaporated milk aims to extend the expiry time. Through this process, the milk will hold a few months even a few years longer. The duration of this durability will depend on the content of fat and sugar in them. 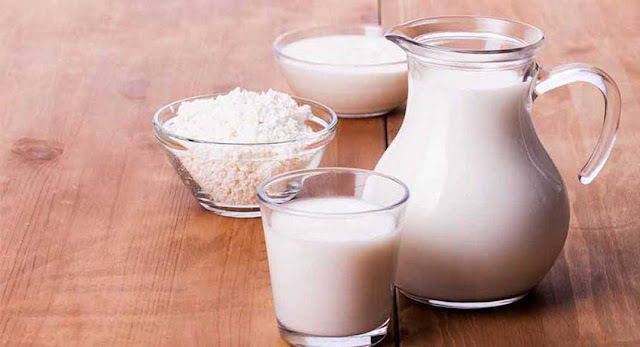 Milk that has been through the stages of production such as the above still does not experience the shrinkage means that when viewed from the side of the high content of nutrients that is important. The process of making evaporated milk keep the content of protein and fat can be digested by the body. The mineral content of calcium, phosphorus, and other compounds in the milk of this type can also be digested, the same as fresh milk. The minerals that exist in the evaporated milk, among others, calcium, iron, magnesium, phosphorus, potassium, sodium and zinc. Meanwhile, the vitamin content in milk of this type includes vitamin C, thiamine, riboflavin, niacin, vitamin B-6, vitamin B-12, vitamin A, and folate. Evaporated milk is usually used to make food or drink that is smooth textured and soft. Some food and drinks usually put on material types of milk are the milkshakes and brownies. And then what if I want to make a snack, but don't have evaporated milk? No need to worry because in fact, it is not difficult to make it yourself at home. - One and a half cup of milk instant powder. Mix the butter and water into a medium-sized saucepan that has been heated. after that, stir until blended. Reduce heat when a mixture of butter and water already boiling. Make sure the mixture is constantly stirred during the process of manufacture. The next step is mixing the milk powder instant into the solution and stir constantly until the mixture these materials are completely soluble. Cook this mixture until it reaches the level of viscosity desired. Let stand the mixture until it cools by itself. Evaporated milk homemade this can be packaged into glass bottles and stored in the refrigerator. The quality will be still good to be consumed at least up to one week after manufacture. If you want to reduce the amount of fat in the evaporated milk homemade, then do the reduction of the dose of butter as you wish. More efficient as well as have the nutritional content that is not much different with fresh milk, making the evaporated milk is a perfect food that can be consumed anytime. With the price is relatively cheap, it makes a kind of milk is worth as one of mine of nutrition for family members.